Perfectly roasted ringnecked pheasant about to be carved! It’s that time of the year when I start really looking in my game freezer to see what’s left from the last hunting and fishing season. Perhaps you do, too? Now that I have a Brittany, there’s meat in there that I definitely have a lot of: ringneck pheasant. Most of it is from bird clubs, as the best deal when you have a birddog that just finds every bird in the field is the end of club season “Shoot Out”. At the end of the club gamebird season, that lasts much longer than the government season because birds are planted in the field for hunters, there’s often a surplus of birds. It’s too expensive for the club to feed those birds all the way until the next season, so they conduct shoots outs to clear the raising areas for new chicks. In a shoot out, the club releases a certain number of birds per hunter. But, then they also let it be known that if you come across more birds than the number set out, and bag them, there’s no charge for those extra birds. With a good birddog you can really clean up! The question then is not whether you’ll get your birds, but what are you going to do with all those birds? Last time out, my Brit, Ziggy, got us into three limits of birds. As one who prefers to clean and hang my birds for a day or two, I don’t use the cleaning and plucking services often offered at such establishments. So, when it comes to plucking this many birds, especially when it’s not a normal two to three birds, but seven to twelve birds taken, your fingers can really cramp up! …But then later in the year, when you prepare those pheasants just right, it makes up for all that plucking work during the hunting season! And which is the hardest for many to prepare? 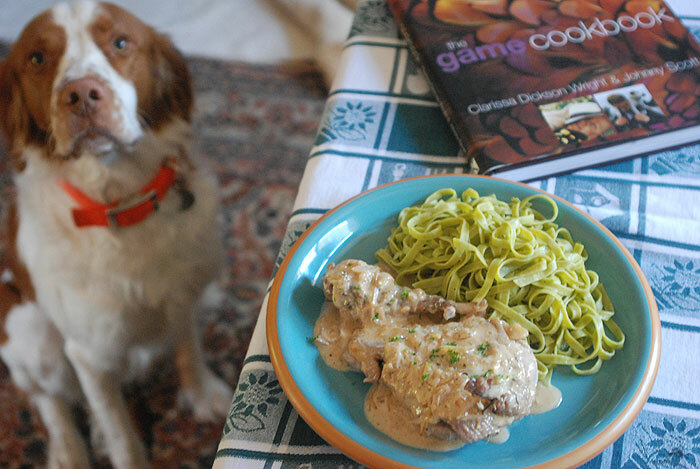 Yes, you got it: roast pheasant! Often it ends up on the table dry, and in the mouth like sawdust. 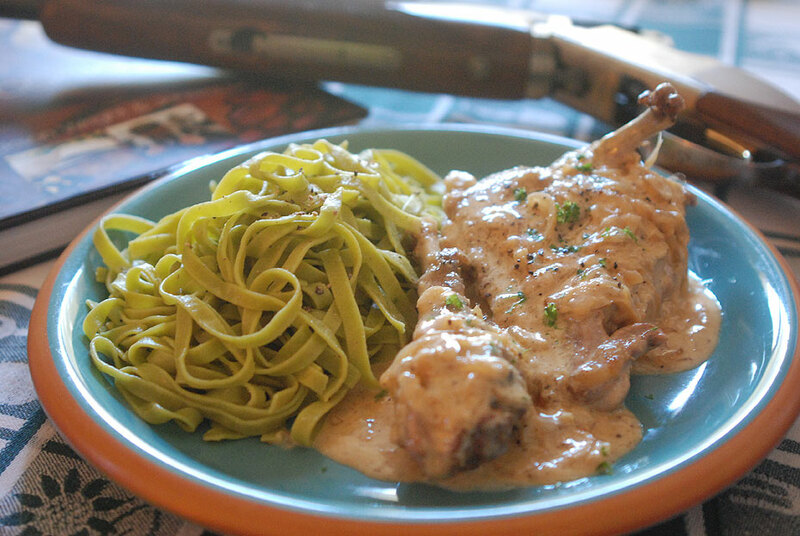 Here’s a recipe that’s guaranteed to keep your pheasant not only moist, but also flavorful! 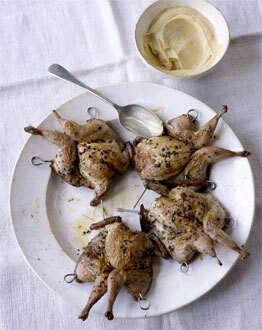 Place the pheasant in a brine of one gallon of water to half a cup of sugar and half a cup of Kosher salt overnight. Drain and let the pheasant rest for a day or two days, breast up in the refrigerator, uncovered to let it dry on the outside. Start with the sauce as it will have to boil down and you’ll have to strain it. Pit and chop five of apricots—cut the sixth apricot into six slices. Place on stove on high heat, then turn down to medium-low heat to simmer, stirring repeatedly. When apricots seem soft enough to push through a sieve, do so, making a puree. Add the liquor, and apricot slices and boil for only a minute to evaporate most of the alcohol and set aside. 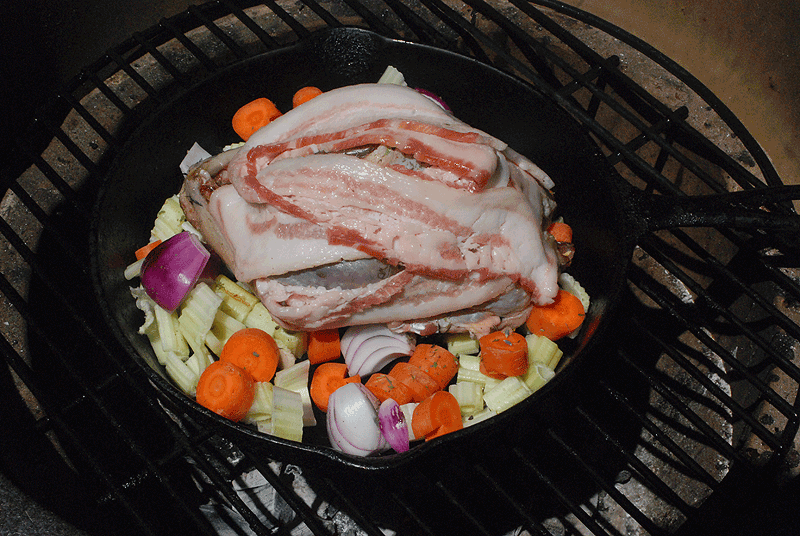 Grab a large skillet and place the patted dry pheasant in the center. Slip two halves of an onion in the cavity, and truss up the legs, or stick the ends in the cavity skin tag of the tail. Grind the Herbs de Provence between your thumb and fingers as you sprinkle them on the pheasant and rub them over the breast and legs. 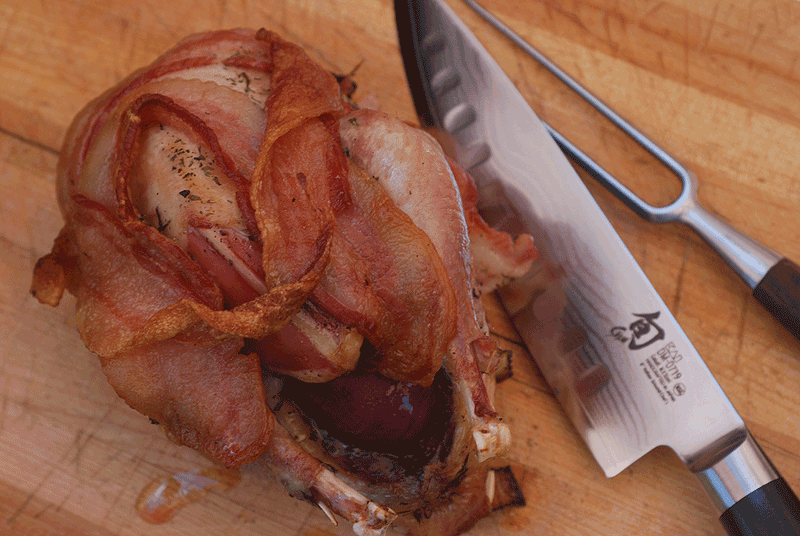 Lay the straps of bacon over the pheasant in a single layer, covering the breast and legs. Surround the pheasant with the carrots and celery. Place the skillet, covered with aluminum foil. If you’re using the Big Green Egg you don’t have to cover it: it makes the bacon very crispy. 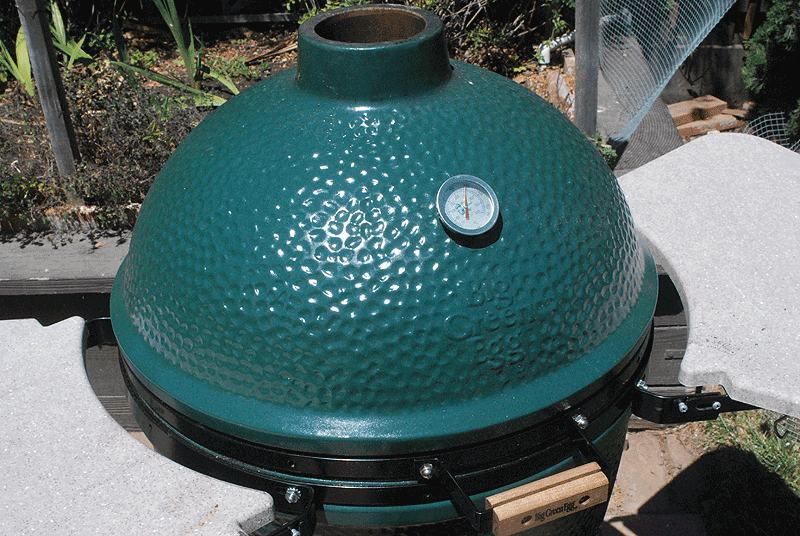 Let enough heat out of the Big Green Egg to bring the thermometer reading fall to 350-400 degrees Fahrenheit. Cook for 20 – 30 minutes. In the last 10 minutes remove the bacon if you want a much crispier pheasant skin. Right after removing the bacon, take the quartered potatoes and wrap in a moist paper towel and set in the microwave for 6 minutes on high. Remove the pheasant to a cutting board and place the potatoes in the skillet to brown by frying in the bacon oil on the stove, or the Big Green Egg’s grill. Warm up the apricot sauce. 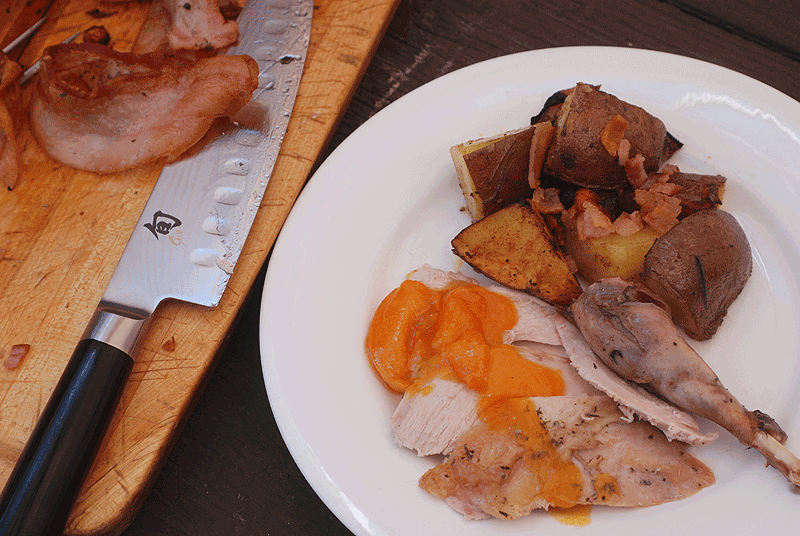 After the pheasant is sliced, set on the plate with potatoes topped with chopped bacon and a line of apricot sauce across the pheasant slices—enjoy! Total preparation: 1-2 days (brining is what really keeps the moisture in and intensifies great flavors). 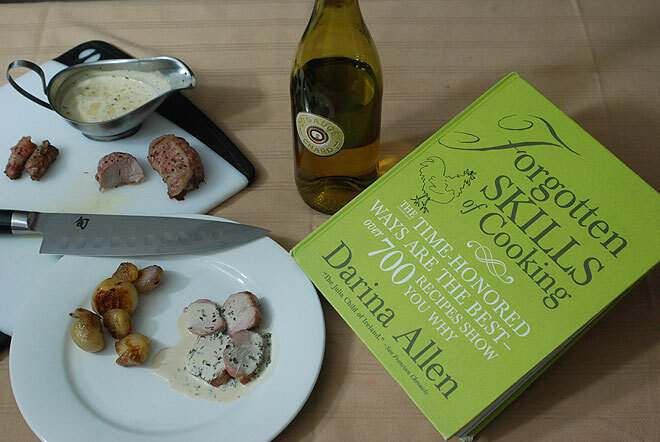 Total cooking time: 30 minutes.